Ride Globally, Shop Locally. Thoughts and news from your Northern Virginia Neighborhood bike shop. I just tried Perpetuem out this weekend for an SM100 training ride, and I loved this stuff. I felt great for most of the ride, and it was alot easier to just drink instead of stopping, unwrapping, and eating other products. 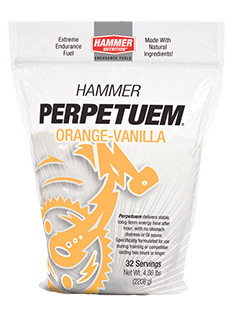 Perpetuem is made by Hammer nutrition, it is easy to digest, has consistent stable energy, Minimizes lean muscle tissue cannibalization, Gluten-Free and Vegan Friendly, and Contains no MSG. It comes in two yummy flavors, Orange-Vanilla, and Caffe Latte, I used the Orange Vanilla one this past weekend, and will try the Caffe Latte next. You can pick these up at either of our shops, we have single serving sizes, and 16 and 32 serving tubs that you can buy. This entry was posted in Uncategorized by The Bike Lane. Bookmark the permalink. I’ve like Perpeteum. I need to pickup another bottle for sole use with it.